I had the pleasure of working with the staff and wonderful Dobies at Doberman Rescue Unlimited to create a photo essay that illustrates a day in the life of their amazing organization. The dedication of the staff and their impact on the lives of each Dobie is clearly evident in the eyes of each and every dog (see photos from their portrait session). The rescue is a place of hope and care created by a very special group of people to whom I am incredibly grateful. Please donate to their organization and, if you think a Doberman is in your future and you live in the New England/New York region, consider contacting them and adopting a rescued Dobie. 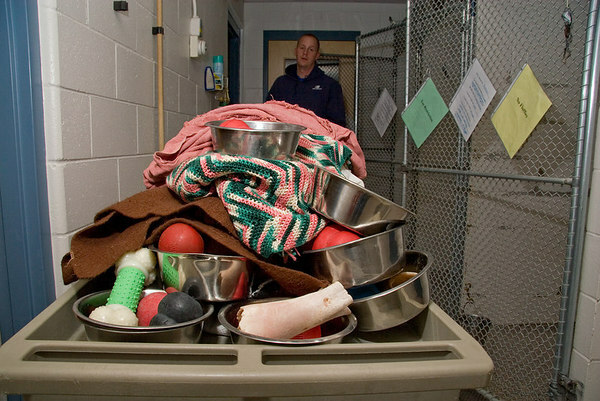 While the dogs are in the outside portion of the runs, the staff collect bowls, toys and blankets for cleaning. Water bowls are refilled, and new bedding and toys are placed in each run.